It looks like not only Motorola captalising on David Beckham being in South Korea, Adidas are too. David attended an Adidas promotional event to no doubt get young kids spending their pocket money on the famous sportswear. Adidas, who reportedly signed a lifetime deal with Beckham in 2003 worth £100 million, are hosted this event where Beckham got to meet his Korean fans in Cheonggye Square in central Seoul. Behind David is a wall which has over 2,000 photos of him making up an overall image of him from his "Impossible is Nothing" advertising campaign with the sportswear giants. The friendly against FC Seoul takes place tomorrow. Not quite in the same league as Manchester United vs. Arsenal, but he is proud enough to play for the Galaxy anyway. For those of you that were wondering, Victoria Beckham was wearing a Diane von Furstenberg Fall 2008 blazer with her dvb jeans and platform tan boots when she was at her dVb Collection unveiling in Toronto this week. We finished third in the Pan-Pacific Championships in Hawaii. We were a bit rusty in the game against Gamba Osaka, as it was our first game together since November, and they beat us 1-0, but I felt we played some good football overall and our 2-1 win against Sydney FC was well deserved. I managed to assist in both goals, which was great for me personally and we’ll look to push on from there in our next few friendlies. We’ve just arrived in Seoul and received an amazing reception from the Korean people when we landed which was great. We’ll be training twice a day in the run up to the game against FC Seoul on Friday as we want to get our fitness just right, but I’m hoping to get out and see the sights when we do get a break from training. The last picture is of a fan who has spent approx $10,000, going to all the US and Canada Spice Girls shows. Now THAT is what you call a true fan, a now broke fan, but a true fan. I am glad she gave him the special attention he deserved. Thanks to Niki for the picture. David Beckham attended a promotional event for Motorola in Seoul on Thursday. 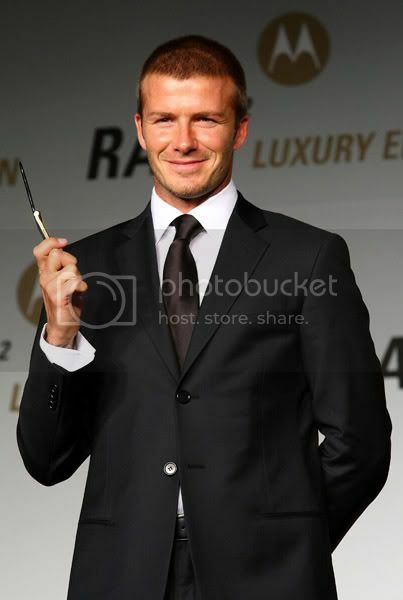 Motorola unveiled its global model ‘RAZR2 Luxury Edition’ to coincide with Beckham's stay in Korea. He looks gorgeous as always in a black sleek suit. David Beckham acknowledged he isn't in good enough shape to make his 100th international appearance for England. "I would love to reach the hundred caps, but I have to be physically ready to be part of the team," Beckham told a packed news conference in Seoul on Wednesday. 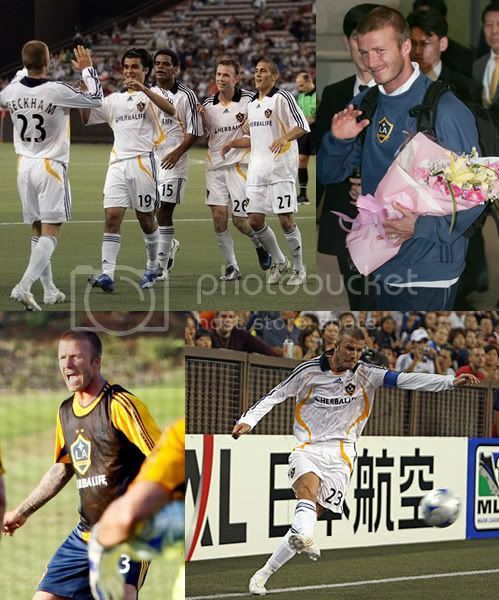 Beckham arrived Tuesday with the Los Angeles Galaxy. The Galaxy begin a three-match Asian tour against FC Seoul on Saturday. They play Shanghai, China, on March 5 and Hong Kong on March 9. Late last month, Beckham was denied his 100th national team appearance by England's new coach Fabio Capello, who thought the Galaxy midfielder was not in top shape. Beckham had not played a competitive match since November. "He is a great manager and a good person," Beckham said. "He is a manager that I understand well and he is a manager that also I've said before that will pick players if he believes they are fit enough." "And with me playing no games, you know, it was only right that there are other players that played many games," he said. Our time is up... we've come to the end of the road… there are tears of both sadness and joy. Look how far we've come! Who would have thought that our reunion could have turned out to be this amazing? It just shows what can grow out of an exciting thought, an idea, a hope, a dream. Yes, our reunion tour is proof that dreams do come true. We have been lucky enough to have shared it with the most loyal fans in the world. Ten years on, you came back still wanting more… and it looks like we made some new friends along the way. You have inspired and ignited us with each show, the 47 that we performed, each time was amazing and it is thanks to you. So we look to the future with hope and imagination and let Girl Power live on through all of you as it will continue in us and the future generations to come. We have learnt so much through you and through each other. "Never give up on the good times always believe in the love you find." "Goodbye my friend, it's not the end… So glad we made it, time will never ever change it… "
The Spice Girls ended their reunion tour amid emotional scenes of hugging and kissing at the band's final show in Toronto last night. The evening was a tearful farewell with Emma Bunton, Victoria Beckham, Melanie Brown, Geri Halliwell and Mel C gathering at the end for a group hug and individual embraces throughout the show. An emotional Geri said: "I've just got to say, as you know, this is the last night of the tour and we never dreamt we'd ever back together and be such a success and who knows if we'll ever get back together again." You can see from the picture below of Geri in her union jack dress that she is crying. The Spice Girls closed the show with a rousing final performance of "Spice Up Your Life." And for the last time Emma, Mel B and Victoria brought their children onstage. To the delight of the crowd, Cruz, wearing a "Posh" T-shirt and red baseball cap, showed-off his breakdance moves. Someone needs to give Cruz his own show because he was break dancing again last night. This afternoon, prior to what might be the Spice Girls last concert ever, Victoria Beckham, met her fans as she promoted her dVb denim and eyewear collection at Holt Renfrew. Victoria is now concentrating on her fashion career, but what about the others? Well it has been reported that other members of the group also have commitments to advance their solo careers. Chisholm will visit MuchMusic to promote the video for her new single, Carolyna, from her solo album, This Time, due to be released in April. Brown maybe a Dancing With the Stars correspondent for Access Hollywood, (correspondent with that annoying voice? urgh) and is working on a a solo album. Halliwell's children's book series featuring the strong female character Ugenia Lavender is to be launched in May. No news on Emma Bunton, but I guess motherhood is her priority with a new baby. Victoria Beckham Takes A Tumble In Philly? "I Can't Bear To Be Without You"
Tattoo #12 For David Beckham? So What Was The Bandage For? The Beckhams To Adopt A Baby Girl From Africa?